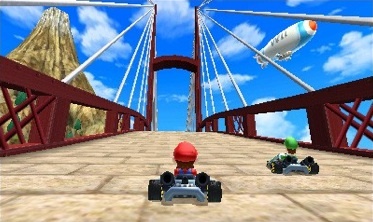 Mario Kart 7 is one of the most anticipated games for Nintendo 3DS, featuring new online modes, classic kart racing fun and, most importantly, a variety of new tracks. We had the opportunity to experience these locations, then created a short list of favorites that'll please fans to no end. The island park was first introduced in Wii Sports Resort, then reappeared in Pilotwings Resort. Here, Miis are seated in the grandstands at the start of the race as you begin a tour through town. The track continues as you head over the bridge and through a tunnel, climbing up a mountain, avoiding traffic and staying away from the cliff's edge. Wuhu Loop stands out because it creates one long circuit rather than three laps (a few of the new tracks do this), and it's a treat to see the island faithfully recreated; it pops up again in the Maka Wuhu track later in the game. This track was inspired by Wii Music, a game we never expected to see again. Although we didn't enjoy that game, this stunning locale features different curves that transform the ground into piano keys, a xylophone and even drums, complete with accompanying noises. Just don't let the cool visuals distract you from the towering piranha plants. Piranha Plant Slide takes us into the sewers of the Mushroom Kingdom, with a rushing tide of water that pushes racers quickly through the track, making turns and jumps a bit trickier to deal with. Once you pass the rapids, you're taken deep underground and underwater as you dodge piranha plants and water jets to finally get outside, only to go through the whole thing again for a total of three intense laps. There are also a few key shortcuts close to the finish line, so keep an eye out. 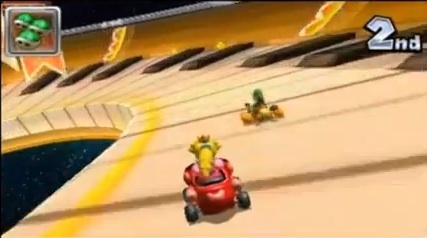 Rainbow Road appears near the end of each Mario Kart. 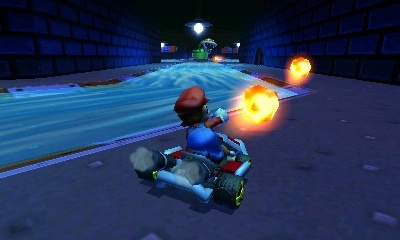 In this case, Mario Kart 7 displays an environment that includes planets and shooting stars, along with sections of the track that flutter like fabric. Similar to Wuhu Loop, this version of Rainbow Road evolves with each lap, as the jumps and obstacles get larger and more intense. We love it. Donkey Kong plays host to DK Jungle, a curvy, hilly course that takes you through a wooded area, past waterfalls and DK's house from Donky Kong Country before launching you into the air. If you know your Donkey Kong history, you'll see the Golden Temple, the final elusive world in Donkey Kong Country Returns. Also, be sure to crank up the volume to hear that funky DK beat.